Swing pipe barbed coupler by tempo - barb size : 1/2"
Please Note: Swing pipe fittings, also known as "funny pipe" fittings, are designed for HDPE swing pipe only. Swing pipe is most often used in high pressure in-ground sprinkler systems. 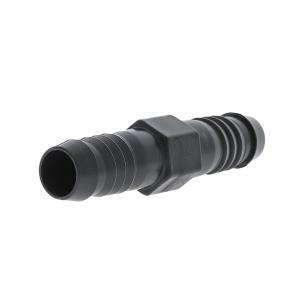 These fittings are not compatible with standard 1/2" low pressure drip irrigation poly tubing. Use the Swing Pipe Barb Coupler to join two sections of 1/2" swing (funny) pipe in a straight line. Swing pipe fittings are used with high pressure 'swing' or 'funny' pipe commonly used in lawn sprinkler systems. Manufactured of hard Acetal plastic for durability, these fittings are designed with easy "Twist In" one way barbs for no leak, no blowout confidence. No glue or clamps required. Maximum operating pressure is 80 PSI.